Now the Koch brothers are coming after my solar panels. I had solar panels installed on the roof of our Washington, D.C. home this year. My household took advantage of a generous tax incentive from the District government and a creative leasing deal offered by the solar panel seller. Our electric bills fell by at least a third. When people make this choice, the regional electric company grows less pressured to spend money to expand generating capacity and the installation business creates good local jobs. Customers who use solar energy also reduce carbon emissions. According to the American Legislative Exchange Council, a conservative network better known as ALEC, our solar panels make us “free riders.” What? It is fair to assume that America is host to an incredibly ignorant population who know very little about their government and how it affects their daily lives. That sad fact was exposed in a brilliant 2008 book revealing that only 20% of the population can name the three branches of government and 49% think a president has the authority to suspend the Constitution. However, the population’s ignorance of their government aside, it is highly probable that every American supports democracy; unless they are members of the American Legislative Exchange Council (ALEC). To Americans aware of ALEC and its intent to create a corporate oligarchy and privatized government, it is not surprising that if ALEC members were asked to sign a pledge to support democracy, they would refuse, and that is precisely what happened in a little-reported story last week. Last Thursday while ALEC was holding its annual meeting in Washington D.C., a group of working family activists, AFSCME, the Postal Workers union (APWU), AFT, and Jobs with Justice appeared at the meeting and asked ALEC members to sign a pledge “upholding the will of the people and support democracy, or leave their states.” The people at ALEC’s meeting did not sign the pledge and corporate-controlled media did not report the event because a revelation that an organization dedicated to serving corporate interests represented by the Republican Party refusing to support democracy would not play well with the public. In fact, for about 30 years ALEC has quietly been dismantling America’s democracy while hiding in the shadows, and it is just recently that a very tiny minority of the population even know ALEC exists. (In the following article ALEC acolyte, Sterling Beard accuses Michigan’s AFL-CIO President, Karla Swift of plagiarizing material in an anti-ALEC op-ed. As most know “Tool kits” are a standard ALEC tool used to put out information to their supporters and encouraging those individuals and organizations to use the material to advance the agenda on specific issues. Now that the same tactic is being used by their adversaries, ALEC and the RW crowd want to cry foul and accuse folks of plagiarism. Here is one current example of ALEC’s use of a “Tool Kit”… “State Budget Reform Toolkit“which has been used and promoted by the Reason Foundation, Heartland Institute, promoted by various SPN or conservative sites such as “State Budget Solutions” and circulated in conservative media outlets such as Louisiana’s “Pelican Post“. The PP article was written by Fergus Hodgson who is the capitol bureau reporter with the Pelican Institute for Public Policy. which is a state think tank member of SPN, which is a private sector member of the American Legislative Exchange Council (ALEC). The Pelican Institute also has ties to ALEC through its annual Policy Orientation for the Louisiana Legislature of which ALEC is a sponsor. ALEC members have also sat on policy panels at the event. …Swift’s editorial lifts content from multiple sections of the anti-ALEC toolkit, copying several paragraphs verbatim. We have posted a copy of the toolkit here, with the plagiarized sections highlighted. In all, seven of the editorial’s twelve paragraphs are found in the toolkit. The editorial is part of the Detroit News’s “Labor Voices” feature, which has published pieces by Swift and three other labor leaders, including Teamsters president James Hoffa. The toolkit, dated December 2013, runs for 16 pages and encourages readers to “expose” the groups. Yes, Montana Supreme Court Justice Mike McGrath, we need public disclosure of personal financial interest and those of their families. Montana Supreme Court Justice James A. Rice, while a member of the Montana House of Representatives, was a member of the American Legislative Exchange Council. ALEC is a corporate bill mill; it is not just a lobby or a front group. It is much more powerful than that. Through ALEC, corporations hand state legislators their wish list to benefit their bottom line. A new study by the Center for Public Integrity shows that outside spending groups, including nonprofits that do not disclose their donors and state-level super PACs, are funneling more and more money into state Supreme Court races. Out-of-state influence likely helped decide recent races in North Carolina, Iowa and Mississippi. It makes reference to a report from a British newspaper, The Guardian, which was covering a Washington, D.C., policy summit of the American Legislative Exchange Council, or ALEC, in early December. ALEC — which cleverly gets around lobbying rules by including right-wing members of Congress in its membership — “specializes in getting the right-wing agenda written into state laws,” according to Poole. Is Carbon Pricing a Diversion From the Real Story? Why Are the Franklin Center’s “Wisconsin Reporter” and “Watchdog.org” Attacking the John Doe? 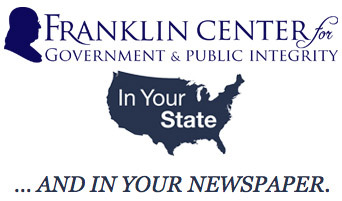 The Franklin Center for Government & Public Integrity (through its Wisconsin Reporter and Watchdog.org websites) has aggressively attacked the “John Doe” probe into possible campaign finance violations during Wisconsin’s 2011 and 2012 recall elections. Its outlets have also published new information about the apparent targets of the investigation, but they have omitted an important detail: Franklin Center has close ties to individuals and groups that may be caught up in the John Doe. …Wisconsin Reporter launched its “Wisconsin’s Secret War” series in October, citing unnamed sources to reveal that Wisconsin Club for Growth, Americans for Prosperity, and Republican Governors Association had received subpoenas, and describing details about “after-hours visits to homes and offices” and prosecutors’ “demands for phone, email and other records.” Thanks to those unnamed sources, Wisconsin Reporter had a new platform, and used it to recast the John Doe investigation as “an abuse of prosecutorial powers” with “the apparent goal of bringing down Gov. Scott Walker.” The Walker campaign and 28 other groups also reportedly received subpoenas. …But in the overwhelming majority of cases, using the card involves a fee. And those fees can quickly add up: one provider, for example, charges $1.75 to make a withdrawal from most A.T.M.’s, $2.95 for a paper statement and $6 to replace a card. Some users even have to pay $7 inactivity fees for not using their cards. This comes full circle to ALEC and it’s member, VISA. As documents acquired and published by Common Cause show, ALEC “untabled” their model legislation titled “Electronic Pay Choice Act” in 2010 at the request of VISA representative, Paul Russinoff. This legislation allows banks and credit card companies to realize huge profits off of fees generated by workers using these payroll debit cards….thus the reason VISA rushed to untable this potential model legislation at ALEC’s December 2010 meeting. As the Times’ article demonstrates, the legislation is making its way across the country through the efforts of ALEC and their SPN partners in crime. Once adopted by ALEC the bill passed the private sector unanimously, and passed the public sector with two dissenting votes. Visa also paid to sponsor a workshop at that meeting. Similar legislation has become law in around a dozen states, according to some estimates. Burton (IN-ALEC) – Conflict of interest, Nah! STATEHOUSE (Indianapolis) — The American Legislative Exchange Council (ALEC) has appointed State Representative Woody Burton (R-Whiteland) as co-chairman of the Financial Services Subcommittee. This subcommittee is an advisory body to the larger Commerce, Insurance and Economic Development Task Force. ALEC works at the state level to advance the fundamental principles of free-market enterprise, limited government and federalism. This is done through a nonpartisan public-private partnership of America’s state legislators, members of the private sector and the general public. The Financial Services Subcommittee deals with matters related to the financial industry and insurance with the intent to design national legislation.Some of the issues they have covered in the past include the Dodd-Frank Act, homeowners’ insurance and mortgage licensing reciprocity. Motion to adopt the model resolution as amended; passed the public sector unanimously; passed the private sector unanimously; Resolution Passed. Shortly after ALEC’s adoption of the Electronic Pay Choice Act we had it in Indiana. One of the more insidious uses of this legislation in Indiana is that it has been applied to citizens receiving unemployment and similar state benefits. Already receiving less than 70% of their former salaries, those on unemployment receive their benefits via VISA cards, with accounts set up through PNC bank. Those without checking accounts must take their benefits via these cards – and pay the additional ATM and withdrawal fees to the bank and in many cases to the state for “transaction fees”. After turning back a political assault on its groundbreaking renewable energy law, North Carolina could soon be a proving ground for a new strategy in the corporate-led war on clean energy — this one targeting the fast-growing number of homeowners installing solar panels. Like the last attack on the state’s renewables program, this one is led by the American Legislative Exchange Council, an influential group that brings together corporations and mostly Republican state lawmakers to advocate for business-friendly legislation — activity that has drawn charges of illegal lobbyingby the nonprofit. ALEC, whose corporate members include major coal and electric companies, has long fought environmental regulations and initiatives that encourage a shift to cleaner energy sources. ATLANTA — The Georgia Public Service Commission (PSC) voted unanimously Tuesday, December 17, 2013, to approve a compromise agreement between Georgia Power and the PSC staff. As previously reported by Atlanta Progressive News, Georgia Power’s original request was for a rate increase of 1.46 billion dollars. The original request also included a newly proposed “solar tax,” a special tax on customers who have solar panels; as well as an increase in the guaranteed profit to Georgia Power. The PSC agreement cut the amount of the increase by 573 million dollars. Now, Georgia’s 2.4 million residential and business ratepayers will pay an increase of 873 million dollars over the next three years. The shipping giant’s “Enchanted Forest” ad came out at the end of 2011, a playful episode about its aspirational seamlessness with nature. How close are those cartoon images to the real world? Judging by the actual adoption of alternative fuel transportation, less than idyllic. FedEx drew widespread praise a decade ago when it unveiled a hybrid electric delivery truck and said it could replace its 30,000 diesel-burning vehicles in 10 years. In its most recent annual report, the delivery giant said its fleet includes 360 hybrid-electric and 165 full-electric trucks, or less than 1 percent of the now-54,100 ground vehicles in its FedEx Express division. JEFFERSON CITY, Mo. (AP) — Buoyed by recent successes in the Midwest, conservatives and business groups are targeting at least three additional states for new efforts that could weaken labor unions by ending their ability to collect mandatory bargaining fees. …Supporters of such laws contend employees shouldn’t be forced to pay fees to a union to get or keep a job. But unions contend the fees are fair because federal law requires them to represent all employees in a bargaining unit regardless of whether they join the union. Most state right-to-work laws were enacted in the 1940s and 1950s. But businesses and conservative lawmakers, working through groups such as the American Legislative Exchange Council, have mounted a new push as union membership has dwindled and the competition for jobs has intensified among states. The State Policy Network (SPN), a web of right-wing “think tanks” in every state across the country, has close ties with the tobacco industry. When tobacco companies like Reynolds American or Altria/Philip Morris want to avoid tobacco taxes and health regulations, reports by SPN groups in many states can help inspire local resistance. A new report from The Economic Policy Institute (EPI), By Gordon Lafer | was published October 31, 2013. It fully connects all the dots between the players involved in attacking the wages and labor standards of America’s workers – union and non-union. It identifies the laws written, the authors of those laws and those who profit from such initiatives. Couched as a response to difficult fiscal conditions, Republican governors and Republican-led state legislatures – many of them in battleground states — have been working hard at eviscerating the rights of public employees. Public workers, however, aren’t the only target of wealthy right-wing funders, major corporate lobbies, and corporate-funded lobbying organizations; non-union and private sector workers are also seen as fair game. As expected, the American Legislative Exchange Council (ALEC) is playing a prominent role in an anti-labor coalition whose agenda is moving along at breakneck speed. The assault on workers’ rights have multiplied in the past few years. In addition to Wisconsin Governor Scott Walker’s anti-union assault, “collective bargaining rights were eliminated for Tennessee schoolteachers, Oklahoma municipal employees, graduate student research assistants in Michigan, and farm workers and child care providers in Maine,” according to this Economic Policy Institute report written by Gordon Lafer. “Over the past two years, state legislators across the country have launched an unprecedented series of initiatives aimed at lowering labor standards, weakening unions, and eroding workplace protections for both union and non-union workers. This policy agenda undercuts the ability of low- and middle-wage workers, both union and non-union, to earn a decent wage. “This push to erode labor standards, undercut wages, and undermine unions has been advanced by policymakers pursuing a misguided economic agenda working in tandem with the major corporate lobbies. The report highlights legislation authored or supported by major corporate lobbies such as the Chamber of Commerce, National Federation of Independent Business, and National Association of Manufacturers—and by corporate-funded lobbying organizations such as the American Legislative Exchange Council (ALEC), Americans for Tax Reform, and Americans for Prosperity—in order to draw the clearest possible picture of the legislative and economic policy agenda of the country’s most powerful economic actors. To make the most clear-eyed decisions in charting future policy directions, it is critical to understand how the various parts of these organizations’ agenda fit together, and where they ultimately lead. All of the Koch network members including; Chamber of Commerce, Federation of Independent Businesses, the Koch brothers–backed American’s For Prosperity, Americans for Tax Reform, the National Association of Manufacturers and of course ALEC are identified as “major corporate lobbies” (players) supporting these attacks upon workers and wages. When researchers look to similar attacks upon public education, advocating charter schools, vouchers and private academies…to the efforts of suppressing voters through voter ID and similar legislation…efforts of establishing state sovereignty to seek taking back federally owned land by states…and election gerrymandering – at the core of each sits the same actors, funded by the likes of the Koch brothers and using ALEC to write model bills advancing each of these agendas. Legislation is how all of these efforts are advanced state-by-state and it is only through ALEC that a coordinated and swiftly moving legislative agenda can be disseminated and accomplished. Without ALEC the corporations, businesses, owners and their “associations,” “federations” and “foundations” could not succeed. Last year Indiana became the 23rd state to pass “Right to Work” legislation – a top initiative adopted and circulated by the American Legislative Exchange Council (ALEC). For several years ALEC (with a corporate membership of more than 300 national and multinational companies) has pushed legislation – that can best be described as anti-union – in most states. In each state where ALEC’s legislative members are part of a GOP majority, these laws have been systematically proposed and passed, nearly word for word as they were written by ALEC’s corporate lobbyists. Sweeping changes in party control of many statehouses after the 2008 and 2010 election cycles resulted in several new “red” states falling under the control of conservative led GOP lawmakers and Governors. With GOP majorities in control of states such as Wisconsin, Arizona and Ohio (each with sitting Governors who are ALEC alum), ALEC’s “model legislation” began being shoved through statehouses with little or no notice to – or regard for – voter’s position on such proposed bills. In this atmosphere, Indiana’s ALEC led legislature/assembly began adopting ALEC written legislation culminating in a contentious fight last year over a proposed Right to Work bill. Organized labor, activists and non-union workers turned out for weeks to protest passage of this anti-union legislation. In the face of a majority of strong opposition lawmakers managed to pass the bill and Governor Mitch Daniels quickly signed it into law. “Lake Superior Court Judge John Sedia found that the law wrongly requires unions to represent workers who do not pay dues. Indiana became the 23rd state in the nation to ban the collection of mandatory fees for representation from unions. “Since then, union lawyers have gone to the courts to try and overturn the law. Sedia issued an order last Thursday declaring the ban on collections and associated criminal penalties unconstitutional. “A spokesman for Attorney General Greg Zoeller says the state will appeal the ruling directly to Indiana’s Supreme Court. Though there was no mention of the involvement of ALEC or their 40 or so Indiana legislative members in pushing this legislation through in the public announcement, those tracking RTW legislation nationally know where the legislation originated and who is behind it. Having researched and tracked ALEC’s activities over the years, it is expected that once the appeal is filed to the IN. Supreme Court an amicus curiae brief will be filed by ALEC and several satellite organizations such as Heritage Foundation, National Federation of Independent Businesses (NFIB) and the Chamber of Commerce. This is the standard Modus operandi for the conservative cabal and reported on by VLTP in an independent Report in 2011. Those opposed to these RTW laws should even now be preparing to throw their collective hats into the ring here in Indiana by following ALEC’s lead and preparing amici filings for the upcoming Indiana Supreme Court battle that is forthcoming.